HUGE PRICE REDUCTION - OWNER IS READY TO MOVE ON If you're thinking about living aboard, coastal cruising or maybe heading to islands this three stateroom motor yacht has much to offer. Highlights: The pilothouse is open to the main salon for excellent visibility fore and aft. Sliding doors open to covered side decks. Main salon opens to a covered full-beam aft deck. Cockpit for fishing, diving, line-handling or just plain relaxing. Transom door opens to swim platform. Three staterooms - three heads. Full-size galley and large dinette down. Inside access to the flybridge. Tender with crane on extended hardtop. Stabilizers and full electronics. 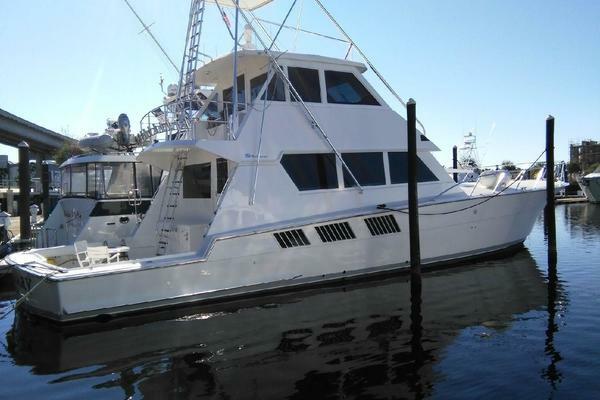 United Yacht Sales New Jersey would love to guide you through a personal showing of this 61' Hatteras 61 Cockpit Motor Yacht 1987. 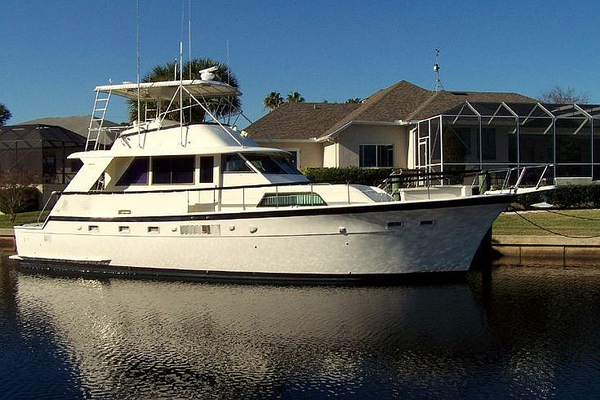 This yacht for sale is located in Quincy, Massachusetts and priced at $244,900. For a showing please contact us by filling out the form on this page and we will get back to you shortly! This is a three stateroom, three head motor yacht. The layout features a large lower galley and dinette with separate washer and dryer forward. Split engine rooms allow access for maintenance. The lower helm is open to the main salon allowing a commanding view both fore and aft. Fly bridge access is from inside the pilothouse. The fly bridge offers a commanding view, has full electronics, helm and companion seats and plenty of seating for family and friends. Other features include a large cockpit, covered aft deck, fore deck lounge and wide side decks.This yacht covers all of the bases for cruising or live-aboard. The command center of the yacht has excellent visibility both fore and aft. All controls and electronics are well laid out. Ample work space for charts and cruising guides. The raised two person helm seat separates the pilothouse from the salon. Fly bridge access to is to starboard. Sliding doors open to covered side decks. Access to the fly bridge is from inside the pilothouse. Swivel helm and companion seats with foot rests and covers. Large U-shaped seating with cover. Arch lighting and bimini top. The galley down layout is ideal for live-aboard or cruising boaters. Bright and airy with plenty of storage space. A large dinette seats six. Hatch in galley floor provides access to the generators, batteries and other systems. The forward cabin has upper/lower berths to port. Use as a third guest cabin or for crew. The full beam master stateroom features a queen-size island berth with storage under. Bright and airy. Lots of storage space. En-suite head w/shower. Corian counter top and opening port in shower. Custom cockpit (65+ sq/ft) provides room to fish, handle lines or relax in the sun! A transom door provides access to the swim platform. 12VDC, 32VDC, 10VAC & 220VAC electrical power. Two generators, a 20kW Onan w/sound shield and a 15kW Kilopac (new 2007). New Batteries 8/2010: eight/32 volt starting and four inverter. The 14' Aquascan RIB (2001) is stowed on the extended hardtop. A Marquipt Crane allows easy off-loading and launching. The RIB is powered by a Yamaha outboard motor. Danforth anchor w/chain and 120 ft. nylon rode.